But no matter how many strange rock formations you see in this part of the world, you can usually count on at least some form of structure – the vast majority of the rock layers here are orderly sedimentary layers, laid down horizontally and then eroded over time by wind, rain, and sand. 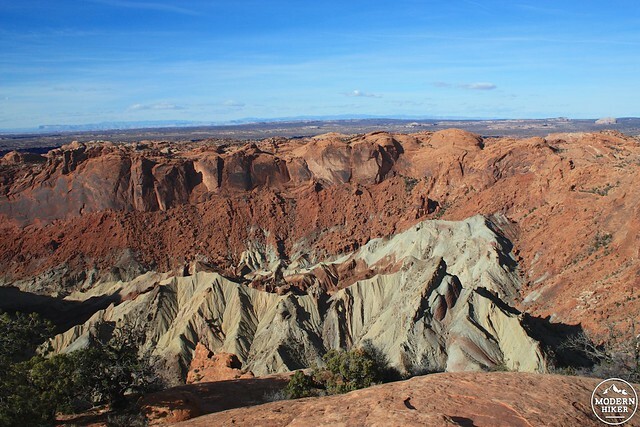 But there’s always an exception to the rule, and for the Plateau that exception is the Upheaval Dome. This short overlook hike will take you to the edge of the Dome, a large crater in the southwestern edge of the Island in the Sky where it looks like all those orderly horizontal rock formations just decided to say “forget this” and do whatever they wanted to. 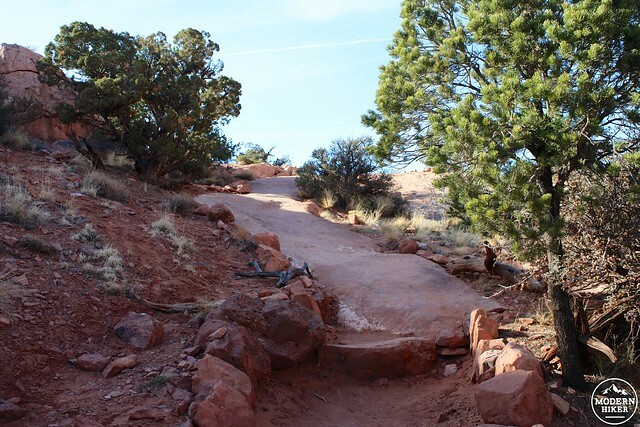 Park at the picnic area and hike up the well-defined, easy-to-follow trail. 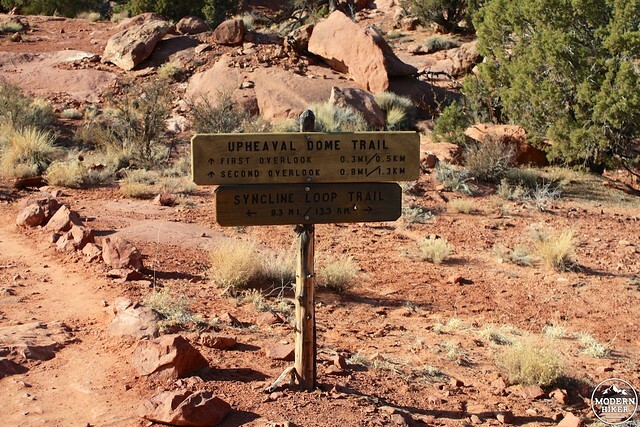 You’ll pass a junction with the Syncline Loop Trail – an absolutely stunning and killer full-day hike that takes you down inside the Upheaval Dome itself – but stay on the Upheaval Dome Trail to get an overview of the region first. 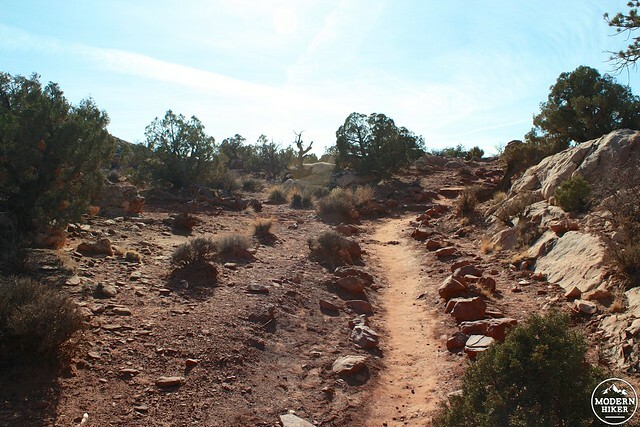 And don’t worry – if you should somehow go onto the wrong trail, there are large signs warning you that you’ve left the “easy” part of the trail. 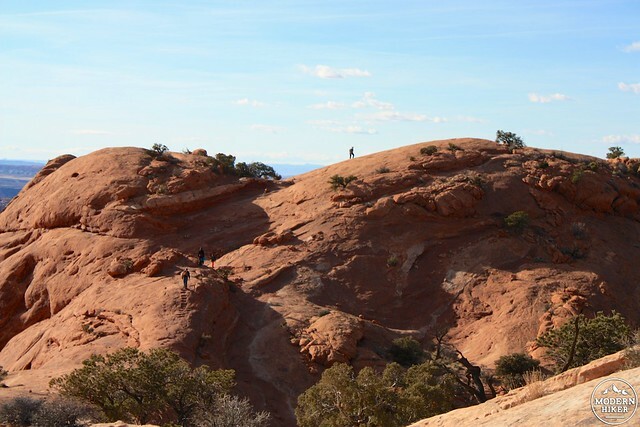 This pleasant trail climbs its way through picturesque strands of low desert juniper and sagebrush, climbing its way over a few boulders and slickrock sections as it approaches the Dome’s first Overlook. 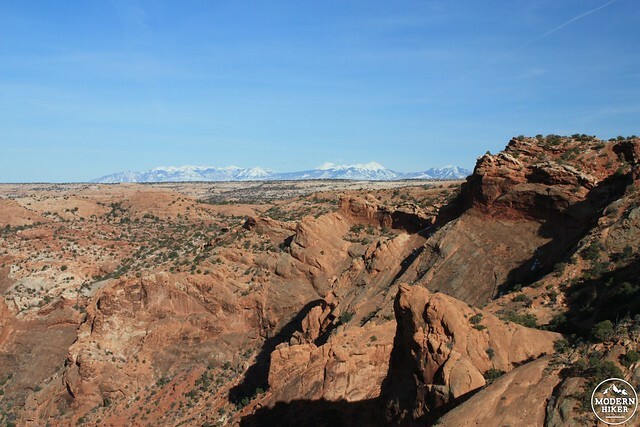 Here, the rock layers aren’t in layers at all – instead they seem all jumbled up and shooting off in different directions. Even the areas just outside the dome seem deformed, stretching in unexpected ways. Interpretive signs near the overlook tell you that scientists are not exactly sure what made this region look like this – some of the theories included an ancient volcanic explosion, meteorite impact, or a large layer of salt left over from a dried inland sea that pushed the rock layers above it into strange shapes due to its lower density. Studies done in the 1990s supported the meteorite theory, and a recent survey in 2007 found shocked quartz in the structure, which indicated the rocks were subjected to the intense pressure of an impact from space. From the first overlook, backtrack a bit to rejoin the trail to the second overlook. 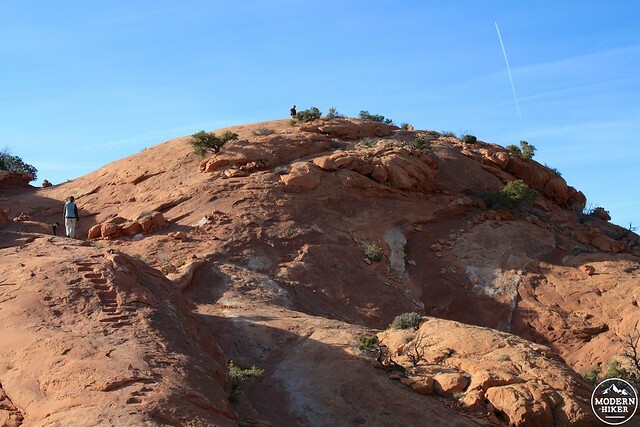 While the second overlook doesn’t necessarily give you a better (or even very different) vantage point on the Dome, the trail does climb up some fun slickrock along stairs cut into the rock itself – and it’s a fun way to add a bit of adventure to this route. 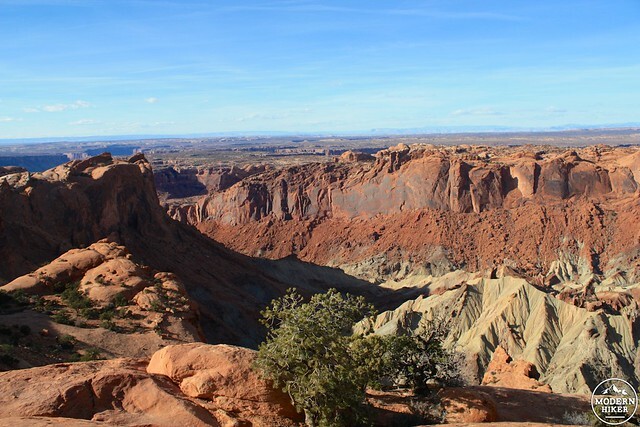 From atop the second viewpoint, you’ll be able to gaze into the Upheaval Dome with the La Sal Mountains in the distance – and if you turn around you’ll be able to see deeper into the Canyonlands themselves. If this trail has piqued your interest in the Dome – and it most likely will – consider taking a day to tackle the Syncline Loop Trail, too – it’s an experience you’re not likely to forget anytime soon. Good. 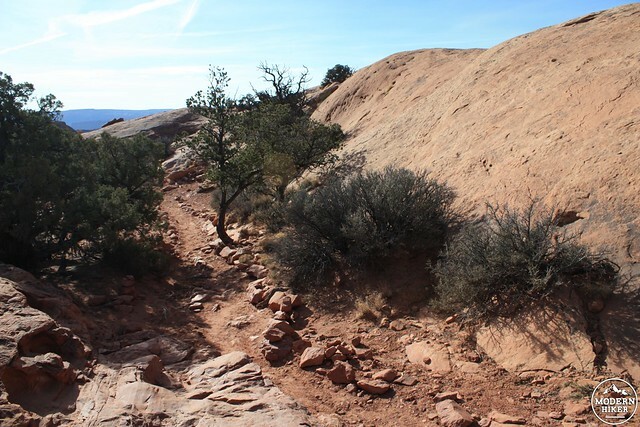 This trail begins on a very clear single-track but then transitions to slickrock trail that ascends up some small but moderately steep domes via steps cut into the rock. 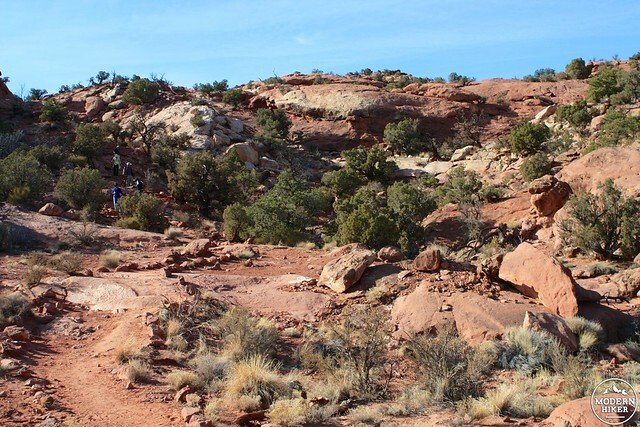 It's a fairly easy trail, but the steep drop-offs and slickrock may scare some people off. The closest developed campground is a few miles to the east at Willow Flat (first come, first-served, no water). 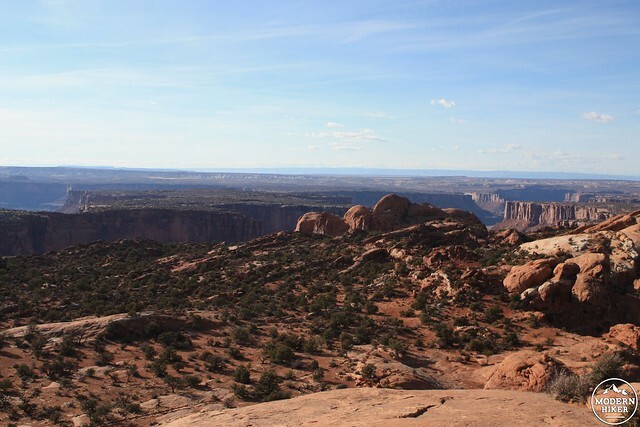 The nearest reservable campsites are at nearby Dead Horse Point State Park.